The finest quality Whole Pimento. Pimento also known as All Spice is a native plant of the West Indies was thought by the Spanish explorers to be a pepper (pimienta) the name was corrupted to pimento and also lives on in the other name for allspice ''Jamaican pepper''. 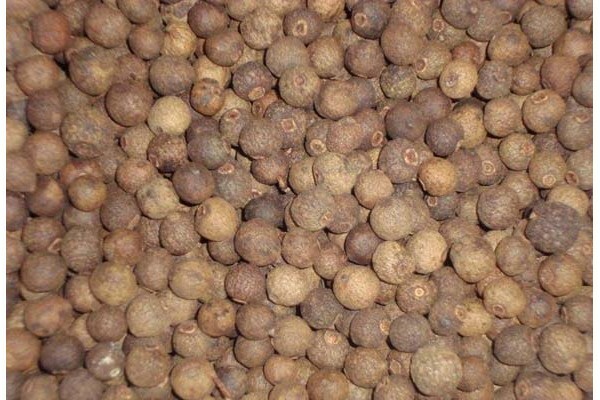 The berries of the tree do resemble peppercorns but they are variously described as having a mixed spicy aroma suggestive of cinnamon clove nutmeg juniper and pepper; hence the name allspice. The berries have been used in pickling and in condiments and are especially used with meats. A form of allspice cured meat was known in the Caribbean as boucan and European sailors who relied on this staple were called buccaneers. Caribbean cooking utilizes allspice in many dishes; it is of limited popularity elsewhere. These sweet pimento peppers are also the familiar red stuffing found in prepared Spanish green olives. The pimento was originally cut into small pieces and hand stuffed into fresh green olives to complement the strong flavor of the olive. Pimentos are commonly used for making pimento cheese a sandwich filling in the Southern United States and the Philippines.